The Colombina Hotel is situated right in the heart of Venice, just 100 metres from St. Mark’s Square with an exclusive view of the famous Bridge of Sighs. To reach The Colombina Hotel you may either use the water transport (either private or public) or have a pleasant walk through the centre following the numerous sign posts to St. Mark’s. 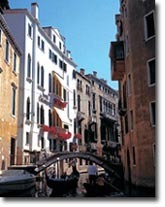 This very nice 4-star hotel provides its guests a stay in a luxury and comfortable ambience, in tastfully furnished Venetian rooms that are able to satisfy the needs of all guests...and what a thrill it is to step into your Hotel directly from a boat, using the hotel’s private water landing. Breakfast rooms, American bar, reading room and meeting room.